SoundTank is an IP launched on the 28th of November 2018 by Ownage Entertainment with the aim to promote the live independent musicians in India. 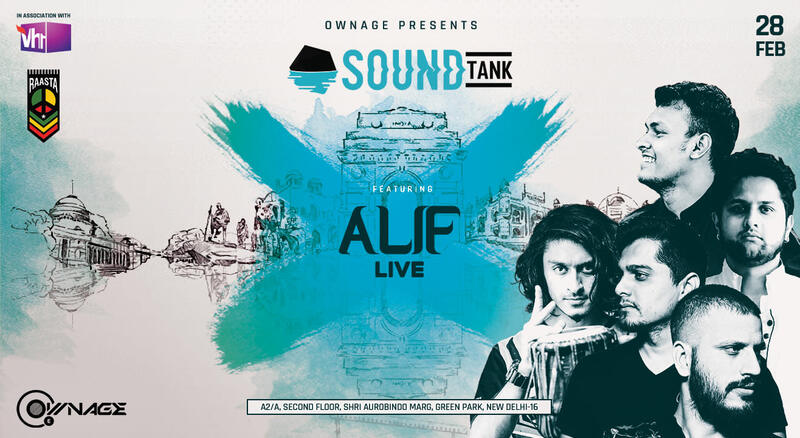 This time one the line up SoundTank brings us the band, Alif. Spoken and sung poetry steeped in Urdu and Kashmiri culture and recounted by singer-songwriter and poet, Mohammad Muneem, the #wordsofalif can easily stand on their own. Lyrical and poignant, relevant and bold. Yet when masterfully blended with Alif’s distinctive genre-defying contemporary and ethnic sound, the experience is nothing short of deliverance. Together, the five member band - Mohammad muneem, Hardik Vaghela, Aman Moroney, Amit Gadgil, Karan Chitra Deshmukh - takes you on a seamless journey from Jhelumas’ chilling crescendo into the rhythmic beat of IRRA award winner for Like a Sufi. From ballads such as the sentimental Main aur Tu to the more classical sound of Dada Saheb Phalke Film Festival’s 2018 “Best Music Video” Lalnawath. As a film-maker and scriptwriter, Mohammad muneem conceptualizes and directs Alif’s music videos and has recently been commissioned to write and supervise dialogues in film projects such as Dishyam’s current production of “Kash Mir Singh” and the upcoming “Torbaaz” starring Sanjay Dutt, for which he is also composing music and lyrics. Alif’s work has also been featured in Sajid Alis / Imtiaz Ali’s feature film “Laila Majnu”.